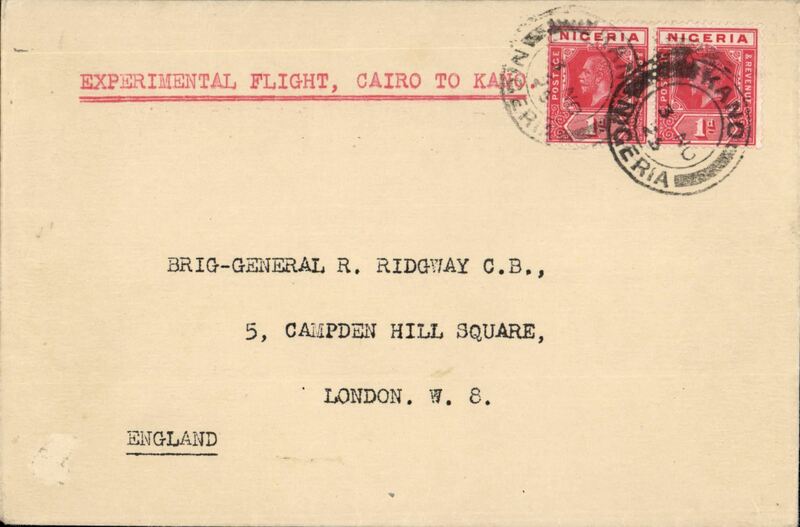 Description: RAF Experimental flight, Cairo to Kano, POA Nov 3rd, Kano dr. cds, plain cover addressed to Brig. General R. Ridgeway, C.B. and bearing ordinary Nigeria 1d and 1/2d stamps. No special cancellations or cachets were used but Squadron Leader, later Air Marshall, Arthur Coningham, put his initials 'AC' in bottom lh corner. Unfortunately a previous owner has tried to erase these on in this particular cover and only barely visible remnants remain. This notwithstanding it is a scarce item and bears a Francis Field authentication hs verso.